It is with a truly heavy heart that I write down that The Colbert Report will come to an end this Thursday, December 18th. The Daily Show spinoff was not expected to last almost a decade, but with a great writing staff and a bona fide star in Steven Colbert the show went on to entertain and influence the nation since it's debut in 05. Colbert will leave a legacy of multiple Peabody and Emmy awards, an amazingly awkward White House Correspondents' Dinner performance, bringing 200,000+ people to DC for the Rally to Restore Sanity and/or Fear and raising millions for various charities. And if you are asking yourself, why so much non hip hop history? The answer is this. Stephen Colbert will go down as one of the most influential figures of the 00s. He uses his fame and persona to inform and counteract the nonsense that goes on in our country. And his last musical guest is Kendrick Lamar. Hip hop is all about (or should be about) being a voice, an intelligent voce, for segments of the population that feel they are not heard. Now more than ever we are witnessing these segments feel their cries for justice at muffled. 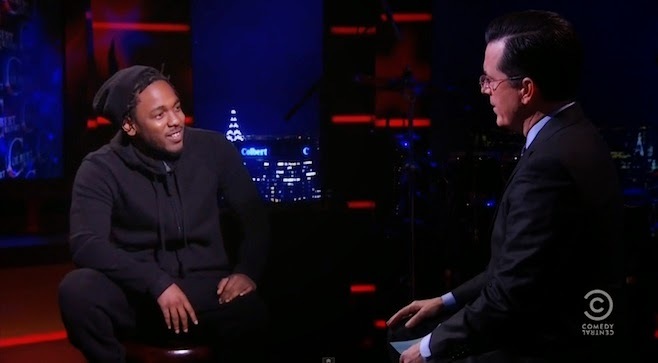 It speaks volumes that Colbert has chosen Kendrick to be his guest and perform on his show. And K Dot brings it with an unreleased untitled song. The social commentary found in the track is classic Kendrick. But what is new is the way he breaks down the song with different interactions with an Asian, Indian, Black and White man. All tell him what he needs to do to be successful. But K Dot chooses to enjoy his successes his own way. There have been a few reports from people who have heard Kendrick's second Aftermath/Interscope LP saying that K Dot will change the game again. He is not resting on the laurels of good kid, m.A.A.d city. And after hearing i and this untitled track, I would say that Kendrick is looking to set the bar high for 015. Peep interview and performance below.